The Taste the Cracklin hog roast in Port Erin is a very popular option for wedding catering, we have been the chosen catering service for many weddings as word spreads about the food and service they have all received. We have a range of different menus which are perfect for all weddings. Our informal buffet menu is great for the wedding reception while our formal sit down meal is very popular for the wedding breakfast. Our most basic buffet is hog in bread rolls, while our elaborate buffet consists of a complete main course. No matter what option you choose we offer a range of different meal choices so that you can create the perfect menu for you. At Taste the Cracklin we can serve you a 3 course meal plus canapés for your wedding breakfast, allowing you to choose two main courses plus a vegetarian course, giving your guests 3 different options. No wedding is complete without fantastic food and with our hog roast menu you can expect nothing less than the best. Whether you want formal or informal, simple, or spectacular we can provide you with what you need. When you choose a Taste the Cracklin hog roast from Port Erin, guests will enjoy the delights that we can provide you with. It’s not just weddings we can cater for, we can do so for just about any event or party. Whether you’re hosting a corporate event and require a buffet lunch or a sit down meal, or maybe you’re hosting a birthday party. Whatever the occasion, we have a range of menus available for you to choose from to ensure that your guests all get something special. If you do not like pork for personal or religious reasons. 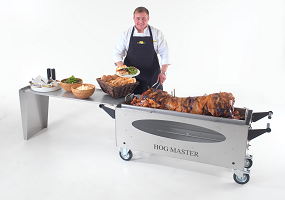 That’s fine, because our hog roast machines are more than capable of cooking just about any kind of meat, so we’re very versatile and can provide a menu that suits your requirements. Simply get in touch with us to discuss your needs and requirements and we can take things from there.